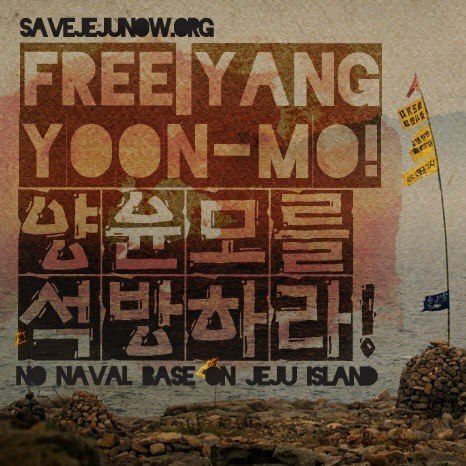 Yang Yoon-Mo, a movie critic and one of the prominent opponents against the Jeju naval base project was directly arrested and jailed from the court on Feb. 1, 2013 . It is his 4th time imprisonment. He is the one who has been jailed the most numerous times during the struggle against the base project by now. (see the below for the details) He was also one of the subjects of the individual complaints to the UN Human Rights Council in 2012. The criminal department No. 4 of the higher court in Jeju (Judge: Oh Hyun-Kyu), annulling the 1st court decisions of probation etc. on him, sentenced 1 year and six months imprisonment against him who has been charged of obstruction of business etc (Refer to the Korean articles). Such court arrest has not occurred before him in the struggle to stop the base project. He also became the first opponent against the base project who got an actual prison sentence. See also here. Given that it was a decision on his appeal aginst the 1st court decision, such an unusual and harsh sentence made people confirm that it was a political retaliation not only against him whose health is already weak for the protest fasts twice in 2011 (more than 74 days) and 41 days (2012) but also the whole opposition movement people against the Jeju naval base project, especially after the government manipulated its political ground to push the base project with a false report on the government-supervised simulation ‘show’ on Jan. 31 (details will come later). It is also a violence that preludes merciless oppression on human rights and environmental destruction. Accidentally Feb. 1 was his birthday and all of his friends and colleagues were shocked, sad, and infuriated. Dr. Song Kang-Ho has been also arrested on his birthday on April 1, 2012 and got the court decision of imprisonment on the anniversary of 4.3, same year. Amazingly the notification letter by the Jeju district court on Feb. 1, 2013 is written for the reason of imprisoning him only in one line that reads that ‘the accused has a reason to run away.’ It is a serious debasement on a man who has put his fate on the Gurembi Rock and a film critic who was acknowledged with a ‘special art award’ from the Jeju People’s Artist Federation on Dec. 28, 2012, for his actual participation in history in person (Korean article). It is also immoral and unjust attitude for the South Korean oligarchies including the court to patch up their baseless accusation on him with a line. 2. Yang Yoon-Mo started a hunger strike again. Photo collection by Park Suk-Jin/ “ I hear the scream of the Gureombi Rock, sitting beside the main gate of the construction gate.. I can’t stand myself even though that is what I can do…” Prof. Yang has sat in front of the construction gates many times after his release in 2012. He has always felt the Gureombi Rock like his own body. For more collection of his photos, see here. 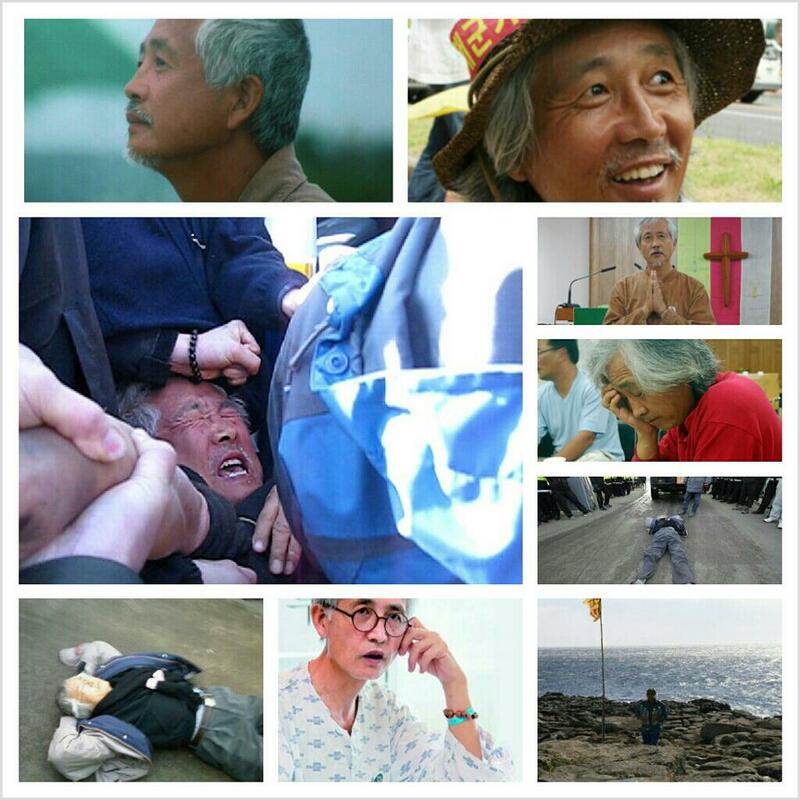 “We just came out from the Jeju Prison where we made a visit to Prof. Yang Yoon-Mo. Prof. Yang said he would enter fast soon to claim the nullification on the government report on the result of simulation (* Jan. 31) and to revoke the Jeju naval base project. Even though Fr. Mun Jeong-Hyeon and chairman Go Gwon-Il made every sort to stop him, he was so resolute to say he would continue fast (* He made a fast in the evening of the day of his arrest, Feb. 1). He says that he will not go out prison unless he dies. He says he is no guilty and he cannot acknowledge his imprisonment because it is a compromise. 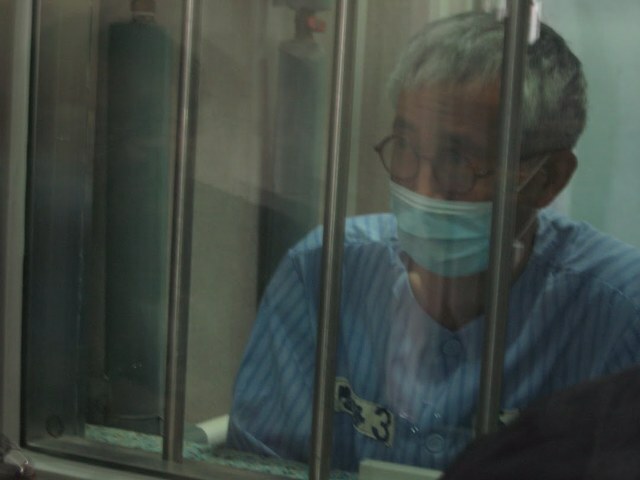 Prof. Yang Yoon-No on his 29th fast day in jail on May 4, 2011 when he held more than 74 days’ hunger strike. 3. We are all Yang Yoon-Mo! There will be a press conference on the court decision against him and a candle vigil in front of the City hall, Jeju City, at 7 pm on Feb. 5. By imprisoning him who is like a symbol of the Gureombi Rock and who has brought the fire of the struggle throughout the nation and world, the oligarchies intend to oppress the opposition struggle against the naval base project. They also want to block the Jeju from being the Demilitarized Peace Island but to put it under the corporation monopoly capital like Samsung and military. If Prof. Yang Yoon-Mo is the Gureombi Rock, we are all Yang Yoon-Mo. The oligarchies lost. We believe in that the fire of the struggle against the naval base project will grow nationwide and globally. 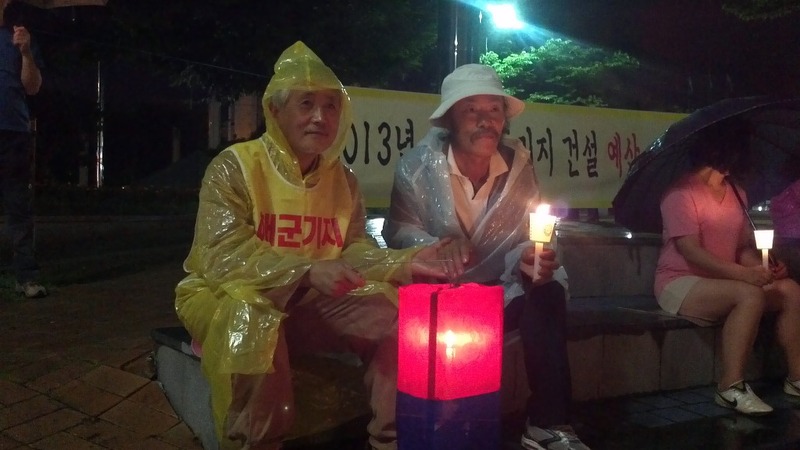 Photo by Navi/ Yang Yoon-Mo with a vest written of ‘no naval base,’ in the nationwide-traveling candle light vigil in Haenam, Jeolla province, in July, 2012. Prof. Yang Yoon Mo has not responded five police calls before his imprisonment. He seems to have decided prison life again. His words on the Gureombi Rock in 2011 can be heard here. Regis Tremblay who is making a film on the Jeju made a film on Yang as soon as he heard the news on Yang’s arrest on Feb. 1, 2013. You can see it here. 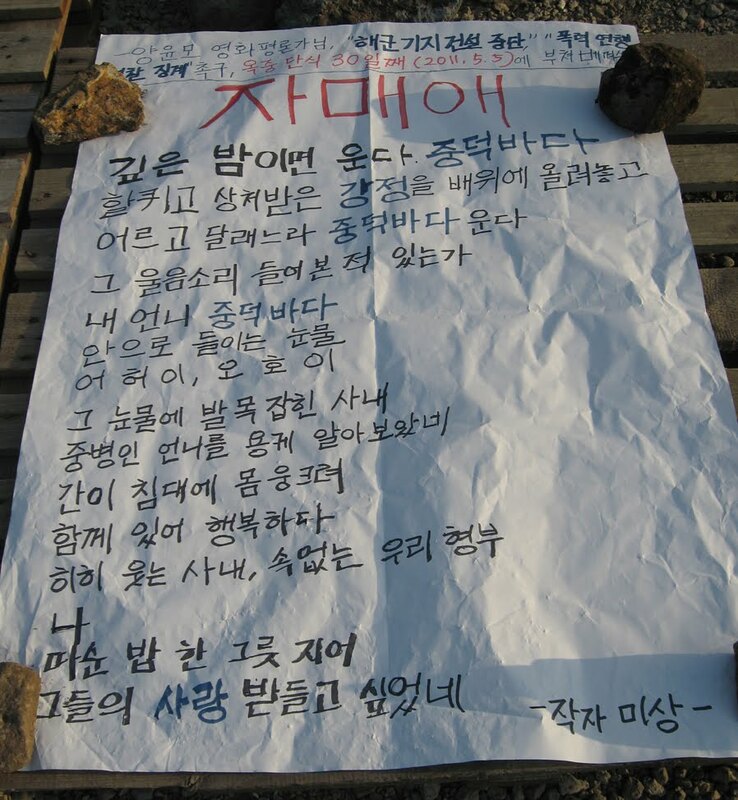 Below is a copy of a poem that has been put in Yang’s vigil tent in the Joongduk coast, Gangjeong village. The title is “Sisterhood.” It is a poem of love between the Joongduk Sea, the land-filled-planned naval base area, and a man who wants to save the Sea. The writer is a woman who calls the man as her brother-in-law and the sea, as her sister. After his arrest on April 6, 2011, the poem was handwritten in a big paper and put on the way of the Gureombi Rock. so that the tourists and even the construction workers could read the poem. Prof. Yang Yoon-Mo, born in 1956, a former President of the Korean Association of Film Critics. 2008: Started to live in Gangjeong village after the participation in the Gangjeong villagers’ Island pilgrim for seven nights and eight days. 2009: Started to live in the tent that would be nicknamed as the ‘Joongdeoksa(Jeongdeok temple) on the Gureombi Rock. He stays there until his arrest in 2011. 2010: Imprisonment by the arrest of Dec. 27, 2010 and release of Jan. 9, 2011. On Dec. 27, 2010, there was a large size bringing-in of materials for the building of residential houses inside the naval base project building complex, which could be said to be the start of the construction in earnest. All the participants who joined the press conference denouncing it were arrested. All were released on the night, except for Yang Yoon-Mo. He had been charged of obstruction of business for the reason to stop the car of the ex-Minister of National Defense, Kim Tae-Young, on March 20, 2010 and damage on navy public information board. The court decision against him, regarding those incidents, had been 1,900,000 won fine but he did not pay. Upon his arrest on Dec. 27, he was imprisoned due to unpaid fines. Even though Yang expressed his will to compensate the fines by prison labor, villagers and some people gathering money for him, made him released on Jan. 9, 2011. 2011: Violently arrested for the reason that he entered under the construction car, with the charge of obstruction of business. Annexed with other charges such as violence in the other incidents, he was imprisoned for 59 days’ until he was released by the court decision of one year six months imprisonment and two year suspension on June 1. At the time, he made more than 74 days’ hunger strike. 2012: Arrested on Jan. 30. Seeing that the police getting order from the construction company thugs, allowed the construction trucks’ entry at the risk of young female activists’ lives, he was infuriated. At the time, he was very weak in health but entered under a construction truck that was illegally making turn at the corner of a bridge, for the expression of protest against illegal construction. He was arrested under the charge of obstruction of business. He made more than 40 days’ hunger strike until his release on March 20 when he got the court decision of 10 months’ imprisonment and two year suspension. 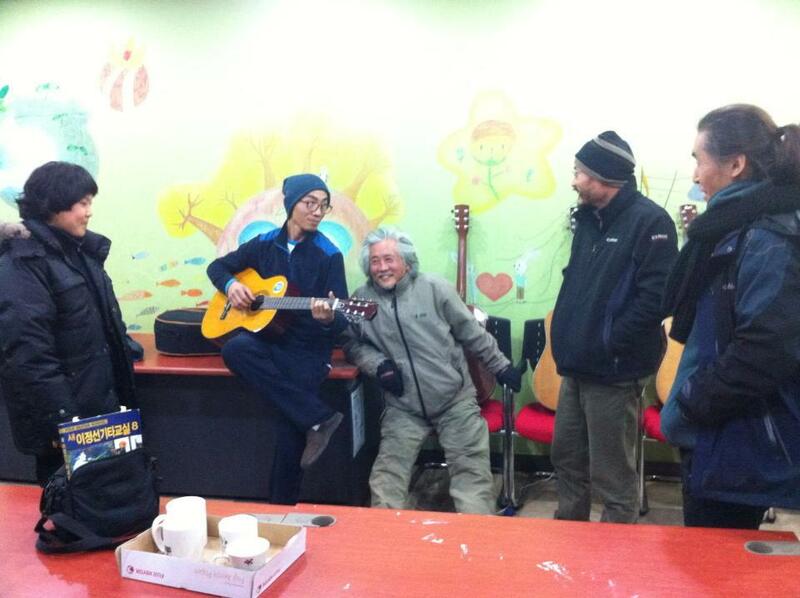 Photo and caption by Choi Hye-Young/ On Dec. 27, 2012, with Dr. Song Kang-Ho and young activist, Kim Min-Sou with guitar. Yang’s dream is to build a ‘ farming film school,’ in the Jeju. He was so moved by the movie, ‘Les Miserable,’ and has been reading the book fully translated. He also said he wants to write a critic not with words but with his life for the remaining of his life.